Update: Are you thinking about joining Mario on his latest adventure? Make sure you check out our tips and tricks guide. Super Mario has become something of a defining character when it comes to Nintendo hardware; Super Mario Bros. effectively sold the NES to the global masses in the '80s, while Super Mario World was a dream launch title for the 16-bit SNES a few years later. Super Mario 64 would revolutionize the 3D platforming genre and prove the worth of the Nintendo 64's new-fangled analogue wand, while the Wii's Super Mario Galaxy gave Mario one of his best outings to date. Now it's the turn of the Switch, a system which has already seen Zelda: Breath of the Wild gleefully tear up the conventions of that franchise. Super Mario Odyssey isn't quite as ardent in its desire to break rules, but it does have some particularly noteworthy tricks up its sleeve. Not that you'd know from the opening premise; Mario's arch-enemy Bowser is up to his usual tricks and has kidnapped Princess Peach with the intention of finally putting a ring on it and making her his wife. This kicks off a rather hair-brained scheme where Bowser travels from kingdom to kingdom, stealing an item from each which is integral to his upcoming nuptials. Taking the something borrowed tradition somewhat too seriously it seems. Mario quickly befriends Cappy – a sentient piece of headgear – and hops on board the flying ship Odyssey to give chase. Even when you touch down in the game's opening levels, it's hard to shake the impression that this is merely more of the same; there are coins to collect, characters to chat with and platforms to negotiate, all taking place within a confined stage, Mario 64-style. However, you soon notice something is very different – Super Mario Odyssey lacks traditional power-ups. There's not a single Mushroom, Leaf or Fire Flower in sight; Mario doesn't change size or alter the color of his overalls, and there are certainly no Tanooki or Cat suits to be found. Instead, Cappy can be flung at nearby enemies to possess them, thereby gaining their unique talents and powers. A frog imbues the player with the ability to leap high into the sky, while a Goomba is capable of walking on ice without slipping and sliding. It's not just enemies that can be possessed in this way; other characters can be “cap”-tured and used to find secrets and hidden routes. At one point you have to possess a slab of meat in order to achieve your objective. While the absence of power-ups could be perceived as a negative, Cappy's talents mean that Super Mario Odyssey gives the player more gameplay options than ever before. Cappy isn't just good for possessing enemies; he can be used in other ways, too. Holding down the throw button after you've released him causes a prolonged spin which is ideal for dishing out additional damage or smashing crates. You can also use him as a temporary platform in this state, which allows you travel across wide expanses of the landscape. 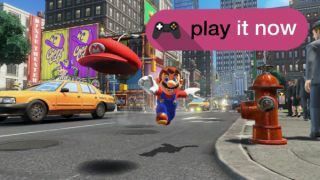 Using the motion controls on the Joy-Con you can add wrinkles to these commands; a waggle of the controllers will cause Cappy to home in on the closest enemy, while other gestures trigger vertical and even circular throws. These commands accentuate Mario's already impressive repertoire, which he has tirelessly built up over the years. He can wall jump, triple jump, ground pound and – of course – leap on the heads of foes to vanquish them. Following on from the linear, tightly-structured levels of Super Mario 3D World – which were designed for chaotic multiplayer fun – the kingdoms in Super Mario Odyssey have a sandbox feel to them, with some stretching off far into the distance. Each one is packed with Power Moons, Odyssey's most coveted collectible and the resource on which your ship depends in order to progress to other kingdoms. Some of these are hidden in plain sight, while others require you to embark on mini-quests such as finding lost sheep or collecting magical notes. On your first run it's possible to collect a certain amount of Power Moons per stage before moving on, but if you're deadly serious about completing the game totally then you can expect many weeks of endless searching. Then there are the coins. The way in which Super Mario Odyssey uses this timeless collectible is nothing short of genius. There are no lives in the game; instead, death merely results in you returning to the last checkpoint and losing a handful of coinage – hardly a major frustration as coins are everywhere. However, coins do have more value here; they are used to purchase new costumes, Power Moons and other items from vendors in each kingdom, so you'll want to grab as many as possible. Each kingdom also has 50 purple coins which are unique to that region; these are also used to purchase items, albeit ones which are more desirable. Finding them all becomes just as compelling as finding the Power Moons – even more so when you consider that some of the costumes on offer can be used to gain access to bolted doors in each kingdom. This slightly revised setup would count for little if the kingdoms themselves weren't up to scratch, but Nintendo's designers have allowed their imaginations to run riot in Odyssey. From the uncanny realism of New Donk City – complete with “normal” looking humans, against which Mario appears quite odd – to the downright bonkers Luncheon Kingdom – where food comes alive and attacks our hero – Odyssey's levels are full of surprises. It's easy to become hopelessly entrapped in these levels as you explore each nook and cranny in search of collectibles and other secrets – in fact, you may find yourself spending longer than you have to in certain kingdoms purely because the act of exploration is so enticing and addictive. On the downside, the devilishly compelling multiplayer witnessed in Super Mario 3D World is gone. Although, a very basic co-op mode – which gives the second player limited control over Cappy's movements – is available. It would have been tricky for Nintendo to factor in a four-player system but its omission still hurts, especially when you consider how much fun the Wii U outing was because of it. Thankfully amiibo are supported this time around, and they actually have a use in-game; you can employ them to seek out Power Moons to make life a little easier. It's also worth mentioning the Assist Mode, which makes things easier for newcomers by giving Mario extra health and showing which direction to head in next. Super Mario Odyssey doesn't discard the core mechanics of the series in quite the same way that Zelda: Breath of the Wild does, but it's fresh and different enough to what has gone before to comfortably rank as one of Mario's finest adventures in recent memory. The process of uncovering all of its secrets and finding all of its collectibles will take the average player weeks if not longer, and the game world is so chock full of intriguing surprises that it's almost impossible to put down. Super Mario Odyssey is one of those unique games which manages to be both instantly familiar and breathtakingly groundbreaking at the same time; it's also the perfect way to round off what has been a remarkable first year for the Switch.